2011 repress. "While this album is certainly a tribute record it doesn't consist of straight-up Sabbath worship in the simple sense of covers. The band sounds as if they are simultaneously paying respect to other Sabbath-influenced projects such as Melvins or Zeni Geva, the later being the former home of Tabata, one of the Temple's latest recruits. 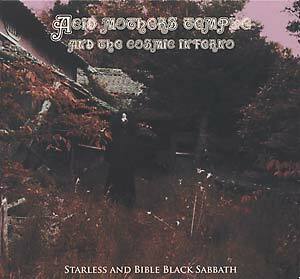 Starless and Bible Black Sabbath consists of two tracks, the first being an epic thirty four minute blowout titled 'Lady from Hell.' The opening cut begins in a similar fashion to Black Sabbath's eponymous open albeit much less dramatic. The second track relates more to the band's obsession with Kraut rock, sounding like the more pop-oriented period of Hawkwind."